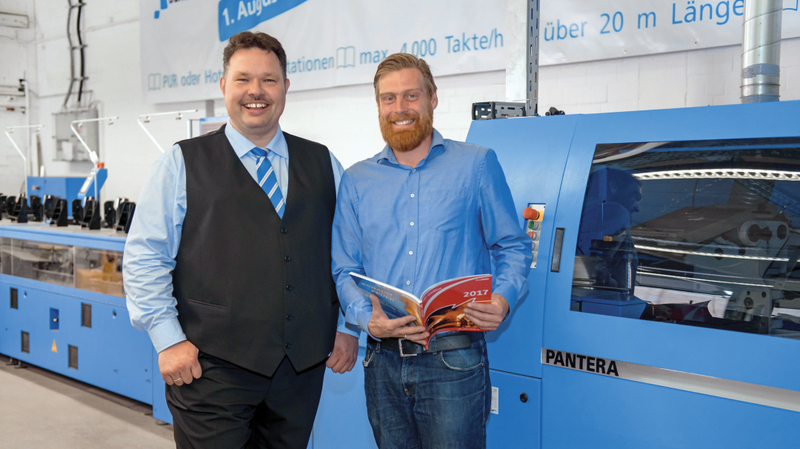 Thanks to a Pantera, the company’s first perfect binder in its 15-year history, PieReg Druckcenter Berlin GmbH is optimally prepared for new challenges. Over the past 15 years, the company has been operating in the German capital with one drawback: The softcover production of books and brochures had to be outsourced to one of its partners. The acquisition of the perfect binder from Muller Martini closed this substantial gap at PieReg. With the installation of the Pantera, the entire value chain is now in-house, making production much more economical. In addition, a simpler logistics process saves time as it is no longer necessary to have trucks drive to a bookbindery and back. For Managing Director Sven Regen (left) and Technical Manager Sebastian Preissler, the Pantera perfect binder rounds out the machinery at PieReg. “Because we use our own employees, we now have better control over the quality standards of the end products,” says PieReg co-owner Sven Regen, citing another advantage of the investment the company has made in its machinery. The Pantera now operates in three shifts, binding business reports, political brochures, art and travel catalogs, periodicals, manuals and street maps with print runs ranging from 500 to 20,000 copies. Managing Director Sven Regen feels there is currently a lot of momentum and wants to make his company the top printer in Berlin.